•London filmmakers Ben Franklin & Anthony Melton’s The Birch movie breathes new life in fantasy-horror genre. •Their unique cinematic approach to horror has garnered praise from Eli Roth, Blumhouse, Crypt TV, and more. •Directing team tells how short films can open doors to major studios in Hollywood. •Find out how jack-of-all-trades mentality and maximizing connections can help you achieve quantity and quality. “We set out to create something beautiful with ‘The Birch'”. The Birch movie, a hauntingly effective and subversive scare, rooted in pure evil, offers sweeping cinematic shots, edge-of-your-seat drama, and stellar acting that you won’t soon forget. You’ll quickly understand why beauty is definitely in the eye of every beholder who sees this film. It’s a horror flick equal to the scariest, bloodiest, most disturbing thriller you’ve ever seen, but with only one distinction: it proudly fits into the short horror film category. But this is exactly why the subjects of our latest interview stand out in the new generation of filmmakers. It’s Halloween season, and with horror films moving to the forefront of the movie universe this month, we recently chatted with two producers/directors whose legions of fans have declared the future of the fright film genre equal parts bright and gloriously gory. 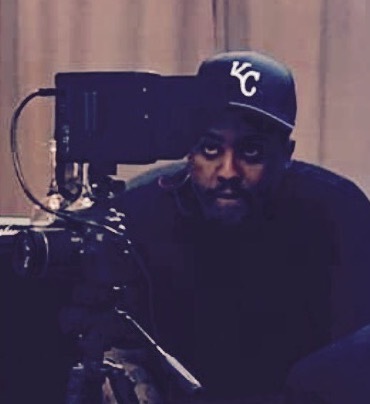 Ben Franklin and Anthony Melton are the directing duo responsible for The Birch movie, a short film that mixes fantasy and terror to tell the story of a bullied schoolboy and his revenge against his tormenter. “She will look after you, protect you, just as I have always done…just as she did for me,” says the boy’s dying grandmother, turning a frail, weakened misfit (a la “Carrie”) into a downright, dark punisher – and protector, of sorts, with the aid of “The Birch”. On the surface, it would be easy to dismiss the film’s premise of a towering, flora femme fatale who tears apart its victims from limb to limb. However, with the filmmaker’s minimal, stylistic and nail-biting choices through: atmospheric cinematography, practical effects, avoidance of horror tropes, and a dream-like narrative – The Birch movie is one of the most effective, cautionary tales of “coming of age” and the dark, hidden dangers that lurk when karma has a lot of “bark” and a murderous bite. “For thee who makes me, I shall come. He who breaks me, shall come undone,” the mesmerizing chant that brings about death and destruction in the form of “The Birch”. 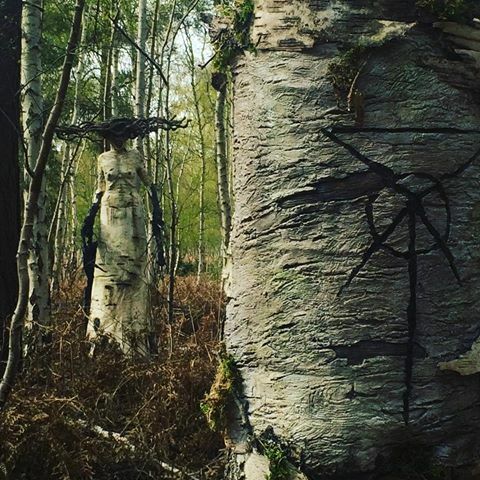 After partnering with the Internet horror brand Crypt TV (and through a spellbinding narrative that interweaves between both the past and present as well as fantasy and grim reality) The Birch movie has garnered over seven million views on Facebook alone, acquiring a cult following along the way. Franklin and Melton are also the producers and Co-Creators of the “Bloody Cuts” series. 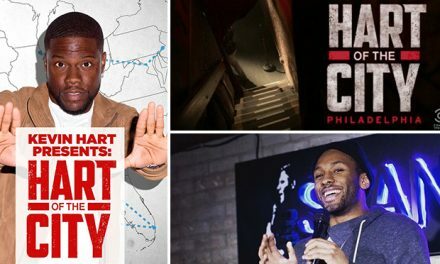 “Bloody Cuts” has become world-renowned for its ongoing series of short horror films, which has caught the eye of such veteran horror directors as Eli Roth (Hostel, The Last Exorcism, Cabin Fever, Knock Knock [and who could forget Roth’s faux “Grindhouse” trailer Thanksgiving] ). Roth is one of Hollywood’s masters of macabre and quickly amassing his own indie empire and Franklin and Melton are following in the same trajectory of success. The filmmakers have proven to be more than just one hit wonders with short horror films like Deathly Presents, which turns Christmas into a dark tale; or Don’t Move, the story about a game night gone wrong after a demonic force is unleashed. These entries merely highlight this duo’s consistency with short horror films and give them clout with the fans of the genre. With the newfound momentum attained by The Birch movie, this tenth entry in their “Bloody Cuts” series has only increased demand for Franklin and Melton as they’re currently developing a web series, a feature length version of Don’t Move, pitching several horror-based reality TV projects, as well as celebrating their most recent success of landing in iTunes’ top 20 with their short film Death Scenes (appearing in the feature anthology Patient Seven [Terror Films]). In our Q&A with the creative forces behind “Bloody Cuts”, we discuss their visionary directing style, the advantages of working as a team, and the inspiration behind The Birch movie – a short horror tour de force that can serve as inspiration and your own playbook for realizing your Hollywood dreams. Once you step inside the mind of these two directors, you’ll discover, as I did, just how beautiful terror can be. RB: What drew you both to the horror genre? Any particular TV shows or films that inspired The Birch movie or any of your other works? BF: I became interested in the genre as an 80s child, when kids (PG rated) films were really much scarier than they are now. I think seeing stuff like Poltergeist and Raiders of the Lost Ark had me wondering what else existed out there that could be darker, and I can still recall the regular ritual of browsing the local video store and going through the horror films – that I was too young for – and being fascinated by the cover art. Films like Robocop – that a friend showed me when I was about 10 – and TV mini-series of Stephen King’s IT – that I watched late night on the BBC – utterly haunted me. So when I was properly old enough to watch 18 certificate films, I watched everything I could, catching up on all the video nasties I’d bookmarked as a kid. For Bloody Cuts specifically, I’m a big fan of shows such as Tales from the Crypt and The Twilight Zone; the anthological/short story format was always something that I wanted to explore and back in 2011, we felt it was the perfect vehicle for online short horror films. AM: I watched Hellraiser late at night when I was definitely too young for it. I remember being drawn into the fantasy of it, and rather than being scared by it I was enraptured by the world that Clive Barker had created. And I suppose the young rebel in me got a kick out of watching something that I shouldn’t have, but I was hooked by the invention…I owe a lot to that film. RB: Did you both study film formally or learn through informal training/hands on experience? BF: I graduated from University quite late, and it wasn’t until I was about 25 that I really knew I wanted to work in the video production industry. I’d studied Media and Culture Theory at University, but only a small amount was practical, so most of the experience I got was when I got my first job as an editor at a London video agency. Much of what I’ve learnt has been self taught, and still very much continues to be that way really; there’s so much training content out there. The opportunities for self-education are only really limited by the time you want to put into it! AM: I studied at Bradford University, after failing miserably at trying to become a rock star and similarly graduated a little later at the age of 24. I did a fairly broad course called Electronic Imaging and Media Communications, which covered most aspects of media practice and theory – from film and television production to designing and building websites. As a result, the breadth of the course was putting me in danger of becoming a jack-of-all trades (which I am to some degree). So, I spent the majority of my spare time trying to specialize in filmmaking and video editing, attempting to capitalize on the free time afforded to me at university. RB: Can you describe your particular style of filmmaking in the short horror films space? AM: Since the inception of Bloody Cuts, we’ve always tried to vary the styles and subgenres of horror that we work within, so to accomplish that we’ve danced around a little stylistically from film to film. That said, we’ve always hung on to two thing: fIrstly, we’ve always attempted to make our shorts feel cinematic, borrowing tropes and styles from the horror films that we know and love whilst incorporating new and contemporary ideas from a visual perspective. We’ve had the pleasure of working with several extremely talented DoP’s over the years, but co-creator and lead cinematographer Jonny Franklin really sets the bar for our visual style. Following suit is the editing and visual effects side of things. Ben and I pretty much cut all of our shorts and just like the photography we push to make the edit feel professional and familiar to modern cinema. We do the same with our score and sound design – we’re so particular with this side of things as sound ‘a movie maketh. Once again we’ve worked with some wonderfully talented musicians and sound technicians who have all brought their own individual styles to each film, but cementing that cinematic style further. 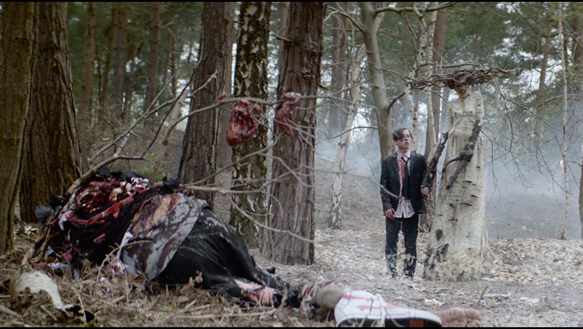 Secondly, we’ve always attempted to subvert the sub-genre of our films, certainly with the Bloody Cuts series. We like to give each film a little twist in the tail; this is mostly always down to the writing. Just like camera and sound, we’ve had the pleasure of working with a host of talented writers. So I suppose our style comes from the melting pot of ideas and talent that we’ve been lucky enough to work with. I guess our directing style is choosing how to stir that pot and ultimately how to pour it over our…err…audience. RB: There aren’t many Director / Producer teams in the world of film; what are the advantages (any disadvantages or compromises) of working as a team? BF: One clear advantage we’ve found is in our ability to divide work up between ourselves – whether on-set or off. For example, on-set we can cover off different departments, or different actors – which is a god-send when you’re shooting fast on a low budget. In Post Production, again we both can edit, as well as perform other tasks such as Visual FX and Sound Design, which save us a lot of money. But I think working as a team has a lot of benefits from a creative perspective because working on your film can sometimes feel a little isolating, whereas having the opportunity to throw ideas back and forth can often culminate in some really great stuff. We also both have slightly different sensibilities, when it comes to horror in particular, and I think our differing tastes and opinions actually helps inform our work for the better. We’re both coming at our productions from alternative angles, and as such we probably have a much more global view of what does and doesn’t work on-screen. Disadvantages… perhaps the issue of having to split payments 50/50 – as people don’t tend to want to pay twice for two Directors! RB: What role do you see short horror films playing in the film industry, and specifically in the horror genre? AM: Short films have always been a manageable and affordable ‘way in’ for all manner of filmmakers to cut their teeth to move on to larger and definitely more expensive endeavors, but that doesn’t mean they don’t deserve to stand on their own two feet as important pieces of artwork. People have been putting together fantastic short films as showcases of their talents for decades, and using those films as calling cards to score bigger roles in the industry. They’ve played an important part in the business for sure. The business has changed; however the short film no longer just stands as a CV for the creatives to get noticed by the industry – in fact it hasn’t really for some years – now a well-executed short film can walk you right in the door of major studios. With the intimidating power of social media, short films can now establish an audience of millions even before the feature script is written. This viewership acts as proof that the story resonates with the most contemporary audience and also builds familiarity with the project – the theory being familiarity, which “equals” bums on “seats” at the box office/VOD sales. Even without a huge audience online, a short film is a fantastic pitching tool, should you try to sell a feature script off of the back of it. A two-to-five minute proof of concept is a much easier way of grabbing the attention of studio execs, and shows so much more potential than the allegedly invaluable lift pitch. Within the horror space, I think you have the clearest evidence that studios and directors have always looked at shorts as a way to expand into features. Sam Raimi’s original The Evil Dead, Mama, Saw, Lights Out and the upcoming Fear, INC are all examples of that trend. Funny enough, those last two [short horror films] were both finalists in a film competition that Ben and I ran called BC Horror Challenge in 2014. Why horror though? My guess would be that the horror audience specifically loves to gobble up as much content as they can, and there’s a massive amount of horror fans willing to watch and support young filmmakers giving it a crack. RB: For those who haven’t seen The Birch movie, can you explain the unique premise? BF: The Birch tells the story of a bullied schoolboy, who takes drastic measures against his tormenter; summoning an ancient being in the woods using a spellbound book passed down through the generations of his family. It’s very much a grounded piece about school bullying, that – through its 5 minutes running time – edges into both fantasy and the supernatural and pays off in quite an unsettling but cathartic way. RB: You convey emotion, atmosphere, story, and a deep sense of dread with every frame – from the cinematography to the editing. How did you elevate The Birch short film to a feature-film-like experience? AM: We set out to create something beautiful with The Birch, whilst still maintaining a darkly, fantastical element of horror intertwined with a sense of reality from our central performances. The Birch started with a creepy story from Cliff Wallace, the man also responsible for the design and production of the prosthesis and costume. We were so inspired by the original story and creature design, the emotion atmosphere and dread tumbled straight from that into a script Ben and I wrote to suit the Crypt TV audience. Cliff’s original take approached a much darker form of child abuse and revenge, but we all agreed to guide the final script in a more ‘Del Toro’ meets ‘Amblin’ kind of way. Central to our creation and inspiration was the beautifully sad, creepy and remorseful creature of “The Birch”, she informed our creative decisions and the picture that Cliff created with her design spoke a thousand words. In regards to Charlie and Aaron, who we cast thanks to the excellent Carey Dodd Associates; they approached the film prior to shooting with a very light script. We really only gave the two teenage characters actions and positioning, and left the dialogue for improvisation. When it came to the two-day shoot, we asked both to not spend any time together off-camera so they could build an animosity toward one another leading up to their first on camera scene. And then throughout the shoot beyond, we fed the guys leading script guides and allowed the pair to improvise their scenes to a large degree. This was a rather unique way for us to direct, as it’s a bit of a departure from what we’ve done before, so it was refreshing and really exciting. Charlie and Aaron then took that method to heart and then refused to speak to each other throughout the entire shoot, save for the rare chance to whisper the odd antagonistic insult at one another. They really wound each other up and informed their performance to positive effect. Their commitment created such atmosphere on set that everybody felt on and off of camera. Aaron’s emotional take on the character of Shaun is then supported by Corrina’s excellent performance as the Grandmother. The Story of the Birch is really that of Corrina’s lineage and we wanted to craft a timeless fable to some degree – something that would suggest a folklore, which would expand beyond the chronology of the film itself – but not overweigh it with flimsy mythology. So through avoiding any rationalizations of the Birch’s existence, and using Kel Winser’s fantastic book artwork to illustrate the myth, we were able to set up the mystery and potential horror of “The Birch”. The Grandmother’s gift to Shaun and her ‘Death-Bedtime story’ form the backbone of the script, so we wanted to cut the film around this, whilst not conforming to a strictly chronological method of storytelling. We allowed the narration and the amazing score by Patrick Jonsson to take a lead over the other action on screen – treating it almost like a music video – and using variable frame rates add further to the dream like quality, plus allowing the editing style to pull us in and out of memory and reality. RB: What served as inspiration for The Birch movie? BF: From a visual and tonal standpoint, both of us looked at a number of less traditional horror films, like Let the Right One In, where there’s a child’s-eye perspective on the world. People have compared it to being something that Guillermo Del Toro might create, but I think that’s partly due to the fact most people associate most modern day (and more uniquely designed) creature makeup with him. But Del Toro was by no means a direct influence – I think it was just one of those stories that was so well conceived by Cliff Wallace that it very much became it’s own thing. Anthony and I had a very clear idea about what we wanted to do with it to bring it all to life. RB: Can you tell us more about your involvement with Bloody Cuts and Crypt TV? AM: Ben and I are co-creators and producers of the Bloody Cuts series and due to its success, we landed representation in L.A. and over the last few years have been building contacts in the U.S. In 2014 Ben and I were over in LA taking meetings and pitching some ideas, and on the way over to see Blumhouse, we had an email from Kate Krantz at Crypt TV, who it turns out are right next door. At the time, Crypt TV was just getting started and it was very much a general meeting, but since then, Crypt has gone from strength to strength and really developed something very special in the horror space – primarily through Facebook. After a period of development on a feature version of Don’t Move, we had a hankering to make another short, and of course the first challenge is always budget. Kate at Crypt TV had posed, when we met back in 2014, that they’d loved to do something with us, so we picked up the phone and pitched The Birch. The rest, as they say, is history. RB: Any plans to take The Birch movie to a full-length format? BF: It’s early days on The Birch, but we’re currently discussing the prospect of a feature length film with Crypt TV, who we produced the short with. There’s definitely a bigger story and one of the recurring comments we’ve had is fans of the short asking to see it as a movie, so there’s certainly an audience too. We have a treatment for the full movie that explores mythology and more troubling aspects of human nature – again with a heavy slant on practical special effects and maintaining the more ‘beautiful’ aspects of the short that resonated with viewers. AM: The feature space is naturally exceeding competitive, so one thing we’ve learned is to have many irons, in many fires. Right now as mentioned above we’re working with a UK company to get Don’t Move into production, and in the States we’ve got a horror script written by Ben and I under option and are currently developing two series – one for television and one for a streaming service. We’re very busy at the moment thankfully, but anything could happen. That’s show business, so watch this space. RB: Is there an art, or secret to scaring people? If so, can it be explained? AM: Not specifically…that’s what is so fantastic about horror, sure we all have inherent primal fears, but we live in a world with such rich, cultural diversity. Different things scare different people in different ways and at different times. In terms of crafting a scare, I suppose there’s a certain art to it (we hope). It’s the mixture of tension and surprise, creating an ‘edge of the seat’ build up, then paying off in an unpredictable way that sideswipes the audience expectation. This doesn’t just deliver jump scares either; the same formula applies to longer form scares and atmosphere. RB: What type of camera equipment do you personally use or recommend to first-time filmmakers? AM: We tend to shoot on RED and Alexa, but have shot on all manner of other equipment, but filmmakers needn’t be limited to getting hold of professional kit. It’s story first, then technology. Most people have a fairly decent camera set in their pocket so there’s honestly nothing stopping people these days. Technology has democratized indie-filmmaking, meaning that it’s easier to capture and distribute on very small or no budget. Whilst you can shoot on a smartphone if you have a little bit of budget, we’d recommend trying to get hold of a fairly inexpensive DSLR – try eBay – with a couple of lenses. Very quickly, you’ll be able to produce great results. Also, the BlackMagic Pocket Camera is a great little tool shooting at 4K and on a flat profile giving you more color options in post. We watch a lot of shorts and find that – despite the camera – one critical area of filmmaking that is so often neglected is lighting. Photography is LIGHT and so, so important to making your films feel cinematic and professional. If you’re thinking about shooting a film, consider your lighting as much as you consider your choice of camera, perhaps even more so. Start with a script, for a story you know you can feasibly shoot with friends/colleagues, put a date in your diary, and get it done. It doesn’t matter if it’s good or not, you don’t need to even show it to anyone! But it’s all learning, and literally each time you shoot something new, you’ll be educating yourself for the next time you do something. Even on The Birch, having already shot fifteen-plus short films, there were things we learned as filmmakers that we can apply to the next production we do. RB: Do you have any advice for shooting short horror films (or films in general) on smaller-sized budgets and working with first-time actors? BF: Really it depends on what stage you are in the production process, but I think at a story stage you should be willing to write for what you know you can sensibly achieve. There’s no point in writing a script with multiple locations, heavy amounts of CG and highly choreographed action scenes if there’s no feasible way of you achieving it. All you do is put up barriers in front of the likelihood of you actually getting something done. I know I spent a long time (before Bloody Cuts) bemoaning a lack of opportunities to make short films, then I realized I just needed to simplify my thinking and use what I had available, as opposed to what was almost impossible (without a $50k budget). When it comes to first time actors, I think the key is to not expect too much from them, and to insure instructions and expectations are done at a level that is reasonable for their experience. Also, allocating the right amount of time on-set so to not pressurize them (or yourself) into rushing performances. Make your set a comfortable place, and the results should hopefully be seen in-camera. RB: What scares each of you? AM: Snakes, Planes… But not ‘Snakes on a Plane’. Weird. BF: Tons of things. I’m actually a bit of a wimp when it comes to a lot of stuff, and hate being scared, which is somewhat ironic! I think creating horror-psychologically allows me to deal with the more fearful things in life, and it’s not so much the on-screen blood and gore. I’m desensitized to a lot of that I feel – but it’s more the unknown – the unpredictability of life… and of course death itself. RB: How do you see the future of the horror genre? BF: I think with the many different digital platforms now, we’ll likely see an even bigger influx of horror through those channels. Horror can be quite cost-effective to make, so putting your film online (via a Netflix-like channel) is a much easier and straightforward distribution model than going through physical DVD/Blu-Ray sales. As for the genre specifically, I’ve been predicting for a while that the more supernatural-focused horrors that we’ve had an influx of over the past few years, will die and be replaced by something else. Horror goes through stages, and I think we’ll see even more reboots of older franchises as well as a return to more practical focused horror filmmaking. With the recent Blair Witch, and new Rings, Halloween and Friday the 13th movies, what will be next? A new Nightmare on Elm Street? It’s practically a given, right? RB: Do you have plans of venturing outside the genre? BF: We’ve already made a couple of Sci-Fi shorts, and that’s a genre closely linked to horror, so we’d love to play a little more in that arena. Otherwise we’re both big fans of all cinema, so I’m sure if the right opportunity presented itself, we’d look at it. But right now, we’re very comfortable working in horror and feel there’s a lot more for us to explore in that genre and have barely started! AM: I’d really like to do a horror-musical. Ok I know that’s still horror but doing a musical would be a whole different kettle of fish for us. BF: Yes, a horror-musical – definitely! As you can see, the future of the horror genre is in good hands with these two visionaries behind the runaway success of The Birch movie. Right now, the dynamic duo is quickly cornering the market when it comes to bloody terror in short horror films. Like a scary clown standing in the woods, it’s almost guaranteed that their mix of fright and fantasy will be creeping into your dreams and a big screen in your town real soon. Follow Ben Franklin and Anthony Melton on Facebook, Twitter, Vimeo & YouTube.